Anyway, I was shooting some images of guests, and just before I shot this image of the group, I saw these two women sitting in the dark area of the third floor at Anthology in San Diego. It was the soft light on the red hair that caught my eye. I then asked them out to the patio area to shoot an image with some of the city in the background. And everyone came along. I had not seen them as a group before I asked the two women for a new location, but as soon as I did, it became this wonderful group on the patio. 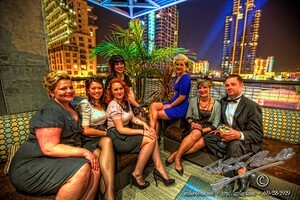 Of course the women are beautiful, but I also find it interesting that the man with the martini, has no socks. And the set of the interior of the Anthology during the event. This entry was posted in Building Exteriors, Cityscape, Event, Groups, Lovely Light, Painterly, S.D.F.A.S.. Bookmark the permalink. The city lights are cool. I think so as well. … Very cool!